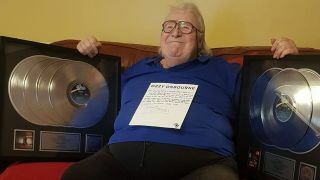 Former Ozzy Osbourne drummer Lee Kerslake has received the platinum discs he asked the vocalist for last month. Kerslake played on Ozzy’s first two solo albums Blizzard Of Ozz and Diary Of A Madman, but due to a legal dispute over credits, the drummer didn’t get the recognition for the part he played in their creation. Speaking with the Metal Voice last month, Kerslake – whose doctors recently gave him eight months to live due to his bone and prostate cancer – revealed he had written a letter to Ozzy and Sharon Osbourne asking for the discs. The Metal Voice also report that the discs will be officially presented to the drummer at the Hall Of Heavy Metal History on January 23 in Anaheim by CEO Pat Guesaldo. The occasion will be filmed for inclusion in Kerslake’s documentary, which is currently being worked on.